I knew the Samurai burger was returning to Singapore a few days earlier, as the McDonald's Singapore Facebook page left a little teaser image with a samurai slicing a burger. 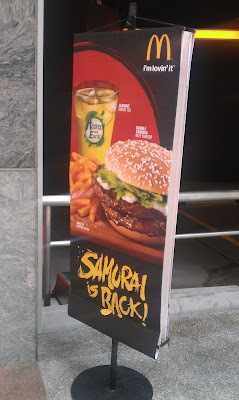 Not only is the Samurai burger a seemingly perennial burger here in Singapore, but it also started in Malaysia a few weeks back, so I had a feeling it would reappear soon. Whereas the Malaysian official website has heavily promoted the new burger, Singapore's homepage hasn't changed for the last couple of weeks, their FB page is where to find most of their info thesedays. Because I had the burger a few weeks ago, and because it's an almost unbelievable $9.45 for the combo, I opted against having the burger. What was new to me was the Cheese McShakers. 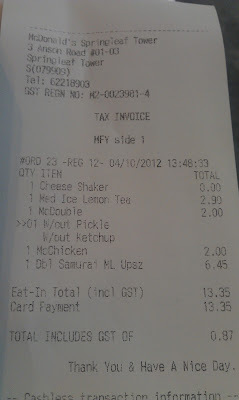 Whereas Malaysia promo seemed to tie in the Japanese theme throughout the set, the burger (Samurai), McShakers (Katsu Curry), and special drink (Sakura McFizz), the Singapore set just seemed a little lacklustre. Not only is it shockingly expensive, what does Cheese have to do with any thing Japanese? Though they are promoting it with Jasmine Green Tea, this isn't anything special as McDonald's Singapore always serves it. Sadly though, like most iced teas in Singapore, it comes heavily pre-sweetened, so I never opt for it. 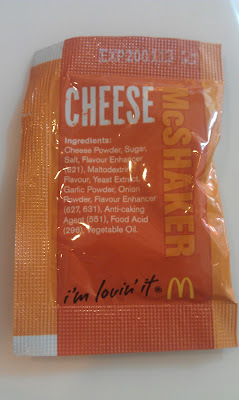 The Cheese McShakers had the same design as the current Malay Katsu Curry McShakers. One sachet held 5g of seasoning, which seemed enough to coat an entire large fry, but like many of my other Shaker attempts, I couldn't get an even coating on all the fries, some were heavily seasoned whereas some were hardly seasoned at all. When I tore open the packet, I smelt a strong recognisable odour coming out of the little pouch. It didn't smell like 'proper' cheese, but it also didn't smell like processed cheese, I just couldn't place my finger (or in this case, nose) on it. Once I took my first bite, I knew exactly what I was thinking of...Kraft Dinner! I don't know why I didn't think of it sooner, as terrible as it is for you, I loved it as a kid. I introduced my Korean girlfriend about a year or so ago (she had never had it before, its not available in Korea), and she stole a couple boxes to make at the office for lunches, though apparently, 2 fully grown Korean women can share 1/4 a box at lunch and call it a filling meal. 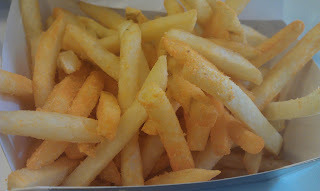 The 'cheese' inside the sachet, had that bright orange colour, and the smell was nearly identical to KD! 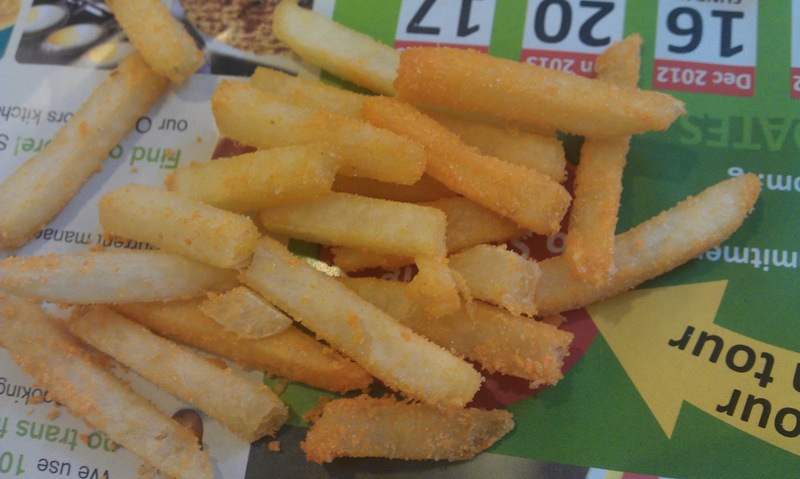 When mixed with the fries, it had a surprisingly addictive taste. 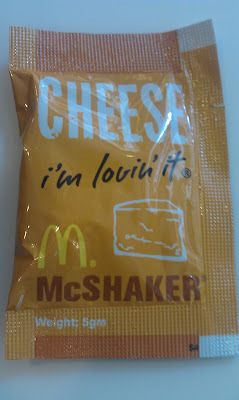 Though I was only stealing some fries from a co-worker, I kept going back for more, and unlike some of the other shakers I've had, I was targeting the heavily seasoned one. Not that I could find a nutrition label anywhere, I'm sure this seasoning was positively terrible for you, it tasted nothing like real cheese should, but it didn't have too.